A young Rohingya refugee plays in Balukhali refugee camp, Ukhia, Feb. 4, 2019. Rohingya has growing concerns about their future in the world's largest refugee settlement in Bangladesh, as many of them suffer from lack of education and guidance. Having fled over the Myanmar border into southeast Bangladesh since August 2017, the 730,000 mainly Muslim Rohingya spent the first year battling to survive, building shelters and readjusting to refugee life. But 18 months on, the uncertainty for the future in camps prevails. Mohammad Hossen, aged about 24, is one of the few Rohingya in the camps to have attended university. He said he was concerned that many youngsters were "losing their character." 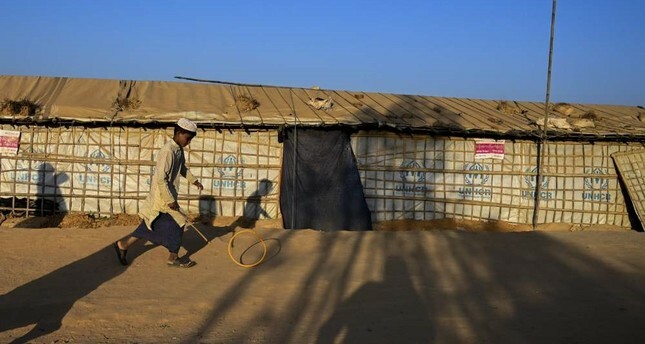 Under Bangladesh government rules, only children aged up to 14 can attend learning centers to study English, Burmese, mathematics and life skills, while aid agencies hire adults on cash-for-work projects in the 34 camps making up the refugee settlement. But this has left a void for teenagers living among the 900,000 plus Rohingya now in the camps, who complain that they struggle to find ways to fill their days. Various aid agencies have expressed concerns that this left teenagers particularly vulnerable to child marriage, child labor, human trafficking, abuse, and exploitation. In a recent report the Inter-Sector Coordination Group (ISCG), set up to coordinate work between humanitarian groups at the camps, said inadequate services for adolescents aged between 15 and 24 remained a major issue. The Myanmar government has long been blamed for genocide against the minority Muslim Rohingya community in western Rakhine State. The huge exodus of Rohingya began in August last year after Myanmar security forces launched a brutal crackdown following attacks by an insurgent group on guard posts. The scale, organization and ferocity of the operation led to accusations from the international community, including the U.N., of ethnic cleansing and genocide. Rohingya Muslims are the most persecuted minority in the world according to U.N. figures and continue to suffer from oppression under the Myanmar government, the army and Buddhist extremists. Over the past decade, thousands of Rohingya have been killed since violence broke out in 2008, causing hundreds of thousands to flee their homeland for Bangladesh, Malaysia and other countries in the region. At least 9,000 Rohingya were killed in Rakhine State from Aug. 25 to Sept. 24, 2017, according to Doctors without Borders. In a report last December, the global humanitarian group said the deaths of 71.7 percent, or 6,700 Rohingya, were caused by violence. The death toll includes 730 children below the age of 5.